The agriculture story of the moment is wheat. It's surging day in and day out, and arguably it's causing riots in North Africa and the Middle East. But what's the cause? Some say it's due to Bernanke and his cheap money policies. Weather is also a clear contributor. 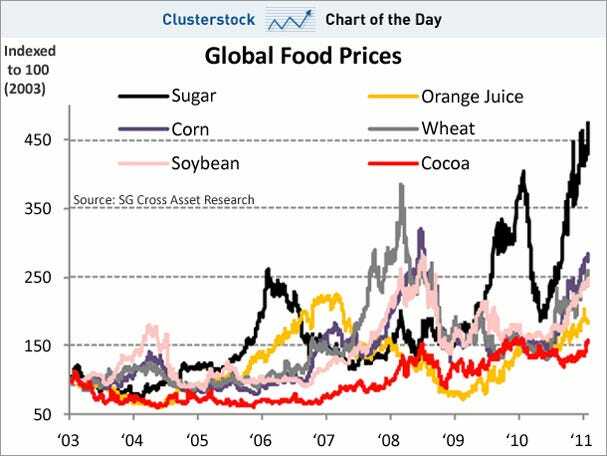 What's clear though is that while all soft commodities are higher, there's a lot of variation. In fact it's sugar, not wheat, that is really in historical nosebleed territory right now. Conversely, cocoa -- which gets tons of hype for being expensive and scarce thanks to the ructions in the Ivory Coast -- really haven't gone nearly as far. So regardless of how much has to do with liquidity and cheap money, soft commodities are still clearly trading in individual markets.